Our intimate Wine Country retreat features a full range of luxury resort amenities, including a few destination-oriented offerings and local excursions that only a premier Napa Valley hotel could offer to its esteemed guests. We invite you to gather with us for breakfast, lunch, dinner or to raise a glass as we celebrate our bountiful harvest from our beautiful gardens. 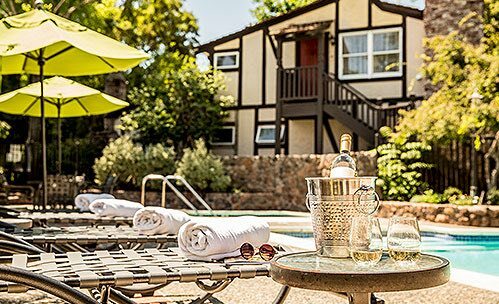 Wrap yourself in an oversized towel, sink into a lounge chair, sip a cool beverage, and take in the serene Wine Country setting. Harvest Inn boasts two inviting outdoor areas, each with a heated swimming pool and hot tub. 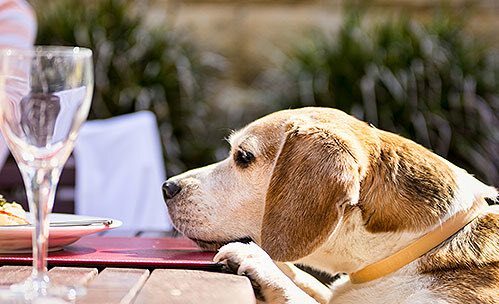 Pets are a part of the family, so why not bring them along to enjoy the experience? Harvest Inn welcomes you and your furry friends to stay at our stunning St. Helena hotel, and we can’t wait to meet them too! We offer several wine inspired amenities and touches, including complimentary wine tastings on Monday and Friday, bottle of wine upon arrival to your room, complimentary car service to wineries within a 3 mile radius and a constantly evolving wine menu in Harvest Table. As a preferred lodging partner of Silverado Golf Course, home of the PGA Tour, you’ll play where the pros play. Steeped in history and owned by the PGA Champion Johnny Miller, we encourage you to tee off during your stay. Please inquire with our concierge for rates and to book a tee time. Harvest Inn is equipped with two electric car charging stations. Guests can purchase Nat Sherman products at the bar during their stay. We also encourage you to explore our ONE MAIN cigar enthusiast gathering monthly. To receive notifications about upcoming One Main events, please call us or email at reservations@harvestinn.com to be added to the invitation list. Gather with us for our One Main cigar dinner series as we savor Harvest Table's farm-to-table dishes - infused with ingredients sourced from our own culinary gardens, paired with cigar‑friendly wines while enjoying vineyard views and the sounds of live guitar. May 2- 5, 2019 - One Main Event!